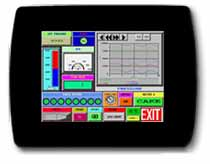 Much more than an operator interface...SCADA-Like without "PC Pains"
It has the easiest to use FREE Programming software. This software has been tested by an independent organization to be the fastest screen development software in the business. Its unique patent pending "online-programming" (not available on any other panel) saves thousands of dollars in bringing a new machine / process on-line or making changes to the program without shutting down the machine/process. Click here to see the software demo or download free software and experience the power of this remarkable software yourself in just a couple of minutes. Uticors software reliability test program ensures a bullet proof software that is also backwards compatible. The PowerPanel is available in all sizes from 6" Monochrome to 15" TFT.